Are you considering Carousel Ads? Below is a great article that share some thoughts you might find interesting! If one picture is worth a thousand words, a carousel ad is worth 10 times that. Literally. According to data found by Kinetic Social, advertisers using carousel ads see a click-through rate 10 times higher than other ad formats on Facebook and Instagram. Carousel ads allow advertisers to use up to 10 photos or videos within a single paid post on Facebook or Instagram. Each image has its own link, which means more space for advertisers to stretch their creativity. On Facebook, carousel ads drive 30 to 50 percent lower cost-per-conversion and 20 to 30 percent lower cost-per-click than ads with a single image. Want to test your own carousel ad campaign? Read on for some examples and ideas to get you started. 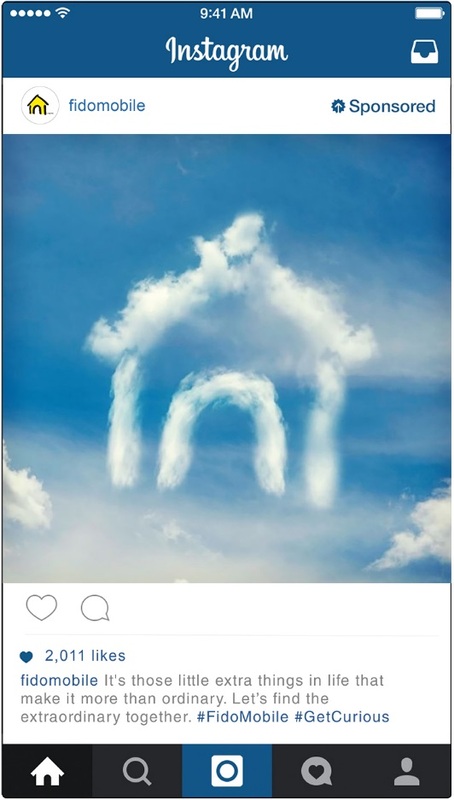 Airbnb repurposed one of their slideshow posts on Instagram as a creative carousel ad promoting their new Experiences offerings. The post is a beautiful panorama photograph of a long paddle boat, divided into three shots. The text accompanying the post highlights the hosts and how they use Airbnb to give guests a once-in-a-lifetime experience. With this carousel ad, Airbnb shines a spotlight on their valuable hosts while showing users the unique benefits of traveling with Airbnb. The post’s call to action includes a link to other San Francisco experiences available through Airbnb. Tanishq, one of India’s most prominent jewelry brands used carousel ads to boost sales and reach a broader Facebook audience. Tanishq has both online and brick and mortar stores and they wanted to use Facebook to marry these two spaces for their customers. For their one-month campaign, Tanishq showcased stunning close-ups of their products and offered special discounts through carousel ads on Facebook. They also included a “Shop Now” button to further entice their audience to take action. With their carousel ad campaign, Tanishq saw a 30 percent increase in in-store sales and a three times higher return on their ad spend. Wondermall is a mobile app that gives shoppers access to over 100 stores and 1 million products. As a fashion-focused platform, Instagram was a great fit for Wondermall’s carousel ad campaign. Wondermall used highly-targeted carousel ads to reach American women aged 18 to 44 who have summer-based keyword interests (sunglasses, sandals, swimsuits, etc.) and like relevant Pages. 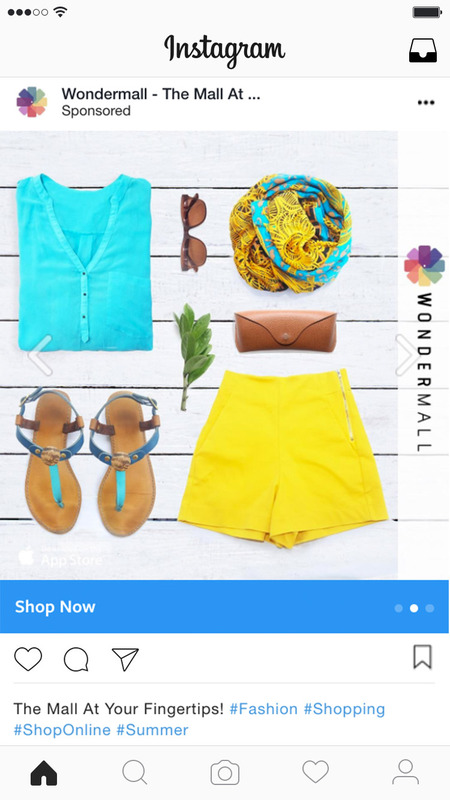 To appeal to their audience interests, Wondermall used carousel ads to feature curated summer goods available through the app. The ads featured a call to “Download on the App Store” and a “Shop Now” button. With a goal of increased mobile app downloads, Wondermall partnered with Facebook Marketing Partner Taptica to launch and measure the campaign. The nine-week campaign drove 36 percent conversion rates, 28 percent of shoppers putting items in their carts, and 8.5 percent completing the purchase. Fido is a Canadian mobile service provider aimed at young millennials. To promote the introduction of new streaming and mobile services, Fido launched their #GetCurious carousel ad campaign on Instagram. Using a specific hashtag for the campaign, the brand was able to easily monitor post engagement and encourage their followers to submit their own #GetCurious posts. With the campaign, Fido reached over 2 million people, saw a 21-point lift in brand awareness and a 19-point life in ad recall. Their target demographic accounted for 53 percent of their impressions, and they saw a four-point boost in brand recommendation across every demographic. 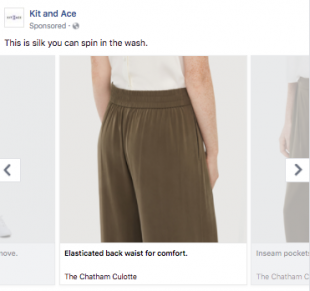 Technical apparel brand Kit and Ace used Facebook’s carousel ad format to introduce a new model of their cashmere pants. In addition to the focus on features, Kit and Ace incorporated images of the pants on models. This allowed audience members to imagine how they would look in the pants and how the pants could fit into their lives. Target’s Style department used carousel ads to help launch their new Marimekko home and lifestyle collection. The ads show a model moving through the different “rooms” created with the multiple frames of the carousel ad. In each room, she is wearing a different outfit from the collection, and interacting with the household products. 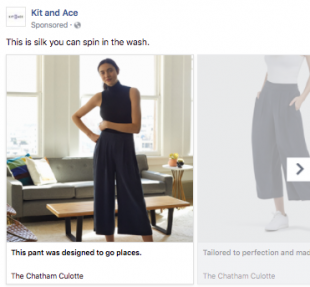 The ads featured colorful homewares and clothes with buttons encouraging customers to click directly through to the product purchase page. This immersive approach is not only creative and engaging, but helps the audience imagine themselves using the featured products. As a business creating your own carousel ads, think about creative ways you can use the format to your benefit. A seamless movement between frames such as Target’s might be an option to consider for your future campaigns. Carousel ads are a great way to showcase your brand’s best products and features. The post 6 Ideas to Borrow from Creative Social Media Carousel Ads appeared first on Hootsuite Social Media Management.